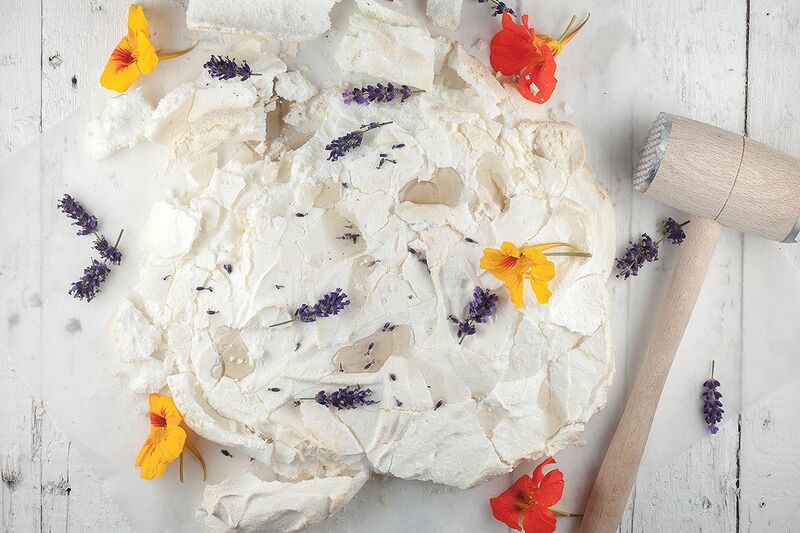 Wow, lemon Pavlova with lavender syrup is a sweet and beautiful dessert and served with edible flowers! Crunchy on the outside and soft on the inside, mm! PRE-HEAT the oven to 110 degrees celsius or 230 degrees fahrenheit. PREPARE an oven tray lined with parchment paper, if you want a perfect round Pavlova, you can draw a circle on the parchment paper. DEGREASE your bowl and whisk attachment, the easiest way to do this is with a few drops of lemon juice on a paper kitchen towel. Then add the egg whites into the bowl and BEAT until soft peaks appear. Gradually ADD 300 gram of sugar and beat until fluffy and shiny. GRATE the lemon and add zest and juice of 1 lemon to the egg whites along with a pinch of salt and 1 tablespoon of cornstarch. SCOOP the egg whites onto the prepared parchment paper and bake in the oven for 1 hour, depending on your oven. The Pavlova is ready when the outside of the egg white is hard, but the inside should still be soft. So it’s basically a large meringue with a soft inside. 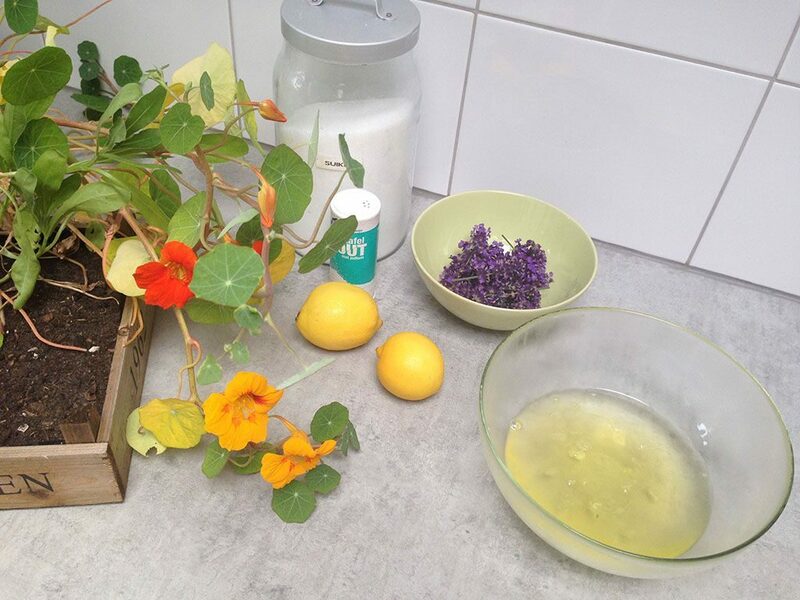 While the Pavlova is in the oven, you can prepare the lavender syrup. RINSE the fresh lavender if needed and add half of the amount to a small saucepan. The other half will be used for garnish. ADD water and the rest of the sugar, that will be 100 grams, to the small saucepan and bring to a boil. Let it cook for a few minutes and then DISCARD the lavender from the syrup using the fine sieve, and that’s it! 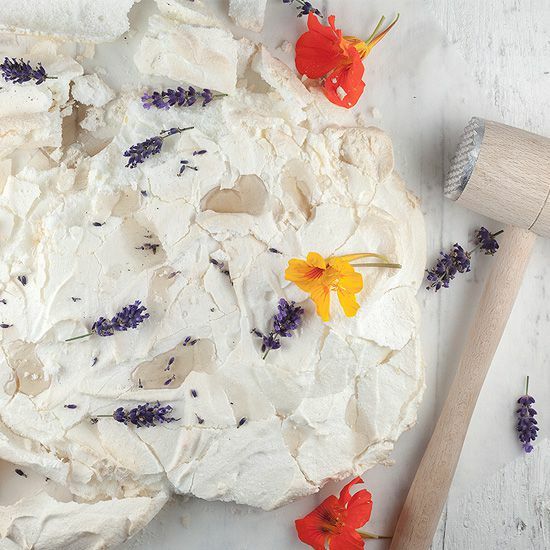 SERVE the Pavlova in pieces with lavender syrup and garnish with some more lavender and edible flowers, enjoy your lemon Pavlova with lavender syrup! I’d like to try some desserts with lavender one day. Pavlovas are a fun dessert with lots of whipped cream and fresh fruit on top. Very sweet though.